June 30, 2017 | -by: Kevin George. Looking for something new to try in your email template? Something beyond images, GIFs, cinemagraphs, and videos? Something even more unique? PRESENTING GAMIFICATION…the most interesting new kid on the email marketing block! ..But do you know a secret? Though gamification is deemed “new”, it is an old tactic that was used by club Nintendo years back wherein they used to reward points for email reads and click-throughs. On that illumination, let’s revive the concept yet again with a fresh perspective. “Gamification is the process of incorporating game mechanics into non-gaming realms so that you can drive the desired behavior from your readers”. It isn’t anything new to add fun elements in the digital world to enhance user experience and gamification is a perfect example of encouraging reward-based engagement. Check out this example of gamification employed by Gmail. The user is more likely to follow the steps in order to achieve that reward of “100% setup complete”. The same concept can be applied in your email marketing strategy too. Let’s start with why you should give a try to gamification in emails! How to Smarten Up Your Email Campaigns with Gaming Mechanics? Take a behavior-based approach if you wish to tread on the path of gamification. You are likely to get more subscriber engagement, better visits on your website, and more newsletter subscriptions by incorporating game mechanics in your email campaigns. Offer rewards to user actions to tempt the subscribers to invite their friends and make them curious to know more about you. To put it simply, determine the motivators that can drive the desired behavior from your subscribers and design a gamification strategy accordingly. Your gamification email should not only fascinate your subscribers but also create awareness among them. Exclusive titles, credits, social awards or discount coupons with QR-codes are great rewards to encourage active subscriber participation in the gamification email. It’s a great idea to have a reward system for subscribers who like, tweet, or share your email. Make sure that these rewards are attractive enough to lure them. Have a scoring system that keeps the subscribers hooked to the email. Alternatively, you can allow the subscribers to earn points for clicking around the email with something interesting at the other end of the click. Take a look at this email by EmailMonks. It cleverly arouses curiosity in the minds of the subscribers regarding what lies at the other end of the click. Brands can employ gamification to drive the end-result of conversions and hold the subscriber’s attention. It can prove to be an extremely successful email marketing campaign, if done right. 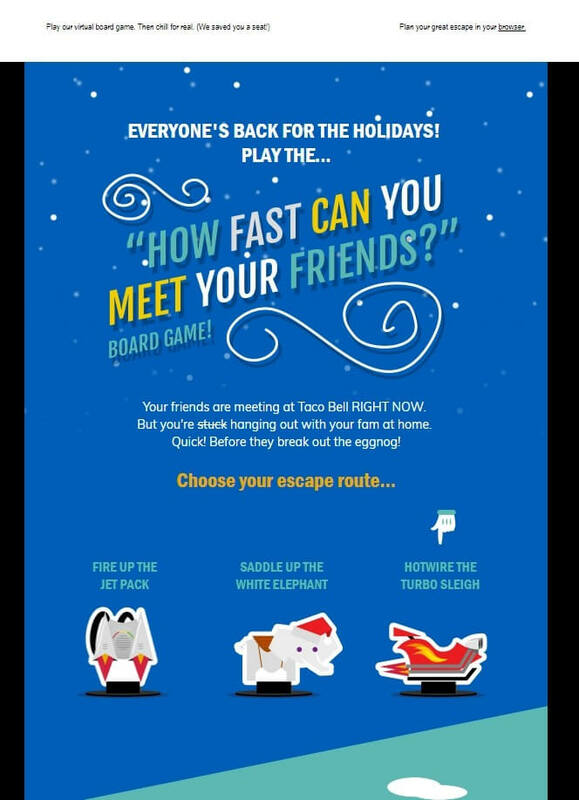 Here’s an example from Taco Bell wherein they have included an interesting board game “How Fast Can You Meet Your Friends”. Check out how they have used gamification to drive more people at their restaurant outlet. How about some exciting quiz questions right in the email with the result promoting your product or services? 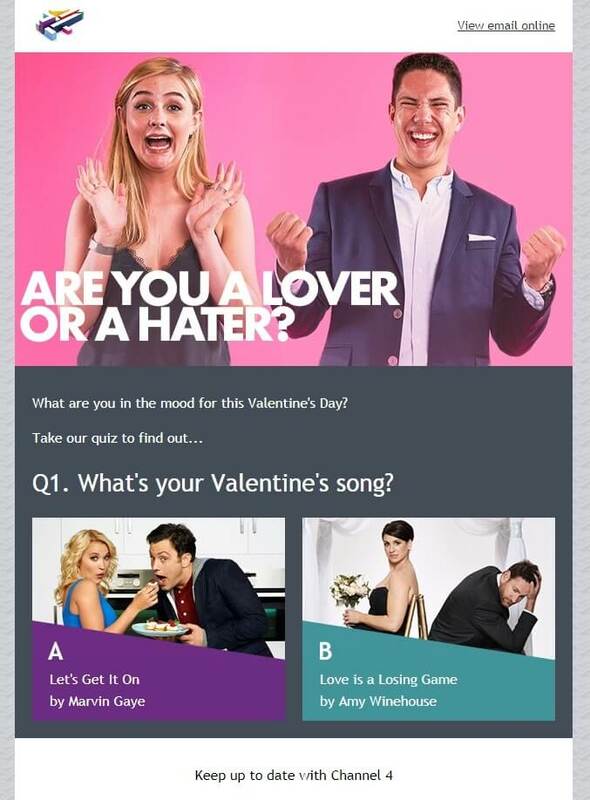 See how Channel 4 leverages gamification in their Valentine’s Day email and promotes the relevant shows based on the answers given by the subscribers. Note: If you are unable to view the gamified email with the quirky questionnaire, click HERE. Holidays are a great time to try your hand at gamification. 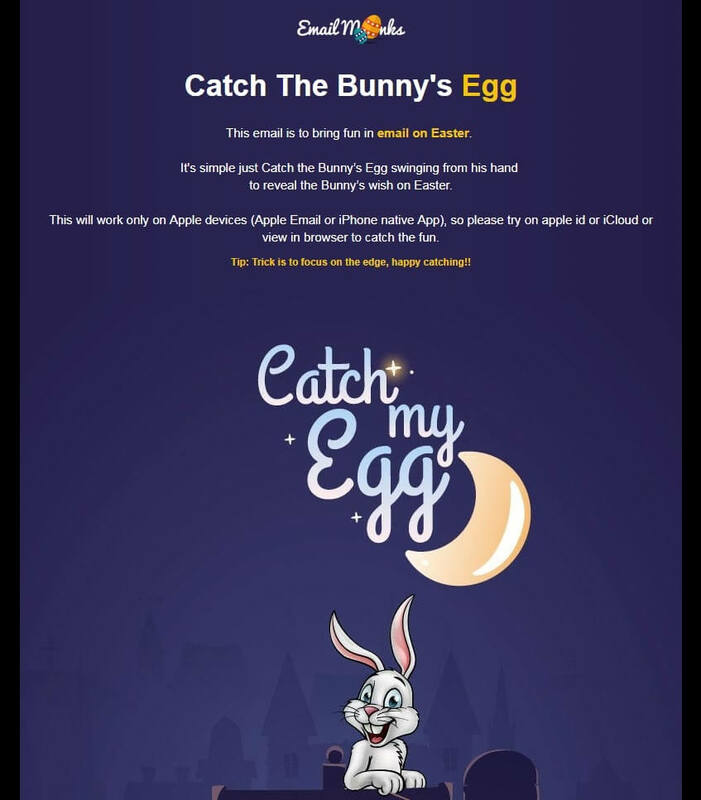 Easter, Christmas, Valentine’s Day and New Year have immense opportunities for successful gamification in email marketing. You can incorporate game mechanics in your emails to entice the subscribers to take surveys and get necessary feedback to improve your services. Gamification paves the way for long-term customer engagement when used in customer loyalty email programs. It can drive more referrals and word-of-mouth publicity too for the brand. The best results for gamified emails are seen in Apple Mail and iPhone Native App. Make sure you include a “View in Browser” link so that your subscribers can enjoy the gaming experience you wish to deliver in the inbox. Are you ready to add value to your business by a GAMIFIED marketing approach and put a sense of enjoyment in your emails? If you’re still unsure about how it will be accepted by your subscriber list, you can try testing a few elements of gamification in your emails first. If it demonstrates a worthwhile response and gets you the desired results, you can have it in your emails every once in a while.